I often use a check-in exercise at the beginning of a retrospective. In my opinion, it’s not a good idea to jump immediately into the search for improvements. No, we all need to warm up, clear our mind and prepare ourselves to be creative. Fill a hat with little pieces of paper that each contain a question. 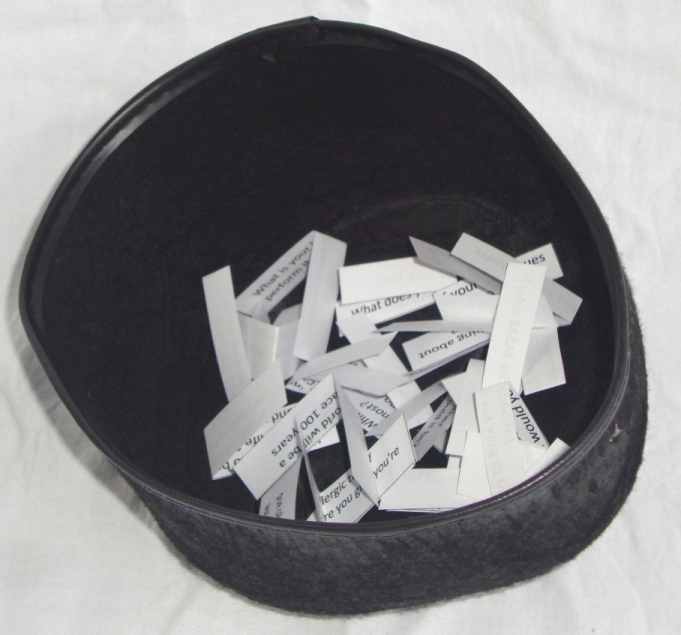 Pass the hat around and ask participants to grab one piece of paper. As soon as they got one, they can already take a look at the question and try to come up with a question in two sentences or less. When everybody has grabbed a question, we start with a go-around, starting with the person who got the hat first. As a facilitator, ask him/her to read the question out loud and answer it in two sentences or less. Then we move to the next person, and so on, until each person has answered his/ her question. I was told* that once a person has spoken in a meeting, he is more likely to speak again. And that’s what we really want in a retrospective, right? People sharing their ideas, many different viewpoints shared amongst the team. To summarize, the goal of the exercise is to improve communication. And if you’re a bit creative with the questions, this can turn out to be a really fun exercise! If someone made a biopic about your life, which actor should play you? You have just produced a hit movie. How will you avoid letting fame go to your head? If you can be one of your colleagues for a day who would it be? Why? What is your best dance move? Perform it. If you were a Simpsons character, who would you be? By using funny questions, you remove some of the tension of the retrospective. Often people enter the meeting feeling stressed because of the open character of the meeting. A retrospective is a time where no topic is taboo and people have to feel free to talk without fear of repercussion. The check-in exercise is an excellent way to remove the tension and increase communication. You make a good point about getting people to speak the first time. Essentially, this is an ice breaker. Get everyone in the mood to open up and communicate. Good idea!